Tuesday Open Ride 4:00pm – 8:00pm – cost $5.00 Unlimited Riding – Check the Calendar for dates. Thursday Open Ride 4:00pm – 8:00pm – cost $5.00 Unlimited Riding – Check the Calendar for dates. Saturday Racing – Registration / practice from 10:00am – 11:30am race starts ASAP. USA BMX membership required to race. Entry fees $7.00 ribbon $10.00 trophy(unless otherwise noted). Trophies given for 1st-4th place. Open Riding and Races are Weather Permitting. Please check Facebook or call (248) 858-0915 for the most up to date information regarding rain-outs. Required for all events: Full-face helmet, long pants and long sleeve shirt. Pads and gloves are recommended. 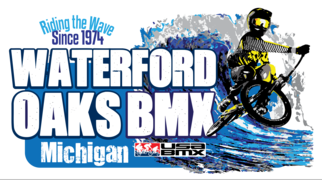 Waterford Oaks BMX Offers Group rates! Great for birthday parties, school outings, camps, scout and youth groups. – $10 per participant includes track time, bike and helmet rental. 72 hours advanced notice required; call 248-858-0915 to book.